Cheap Dollar Sign Necklaces - 12 Ct.
Dollar Sign Necklaces - 12 Ct. Ideal party favor for�any Mardi Gras or Carnival�celebration! Get the Mardi Gras started with Mardi Gras Beads. These silver beads feature a large silver dollar sign pendant for extra bling. 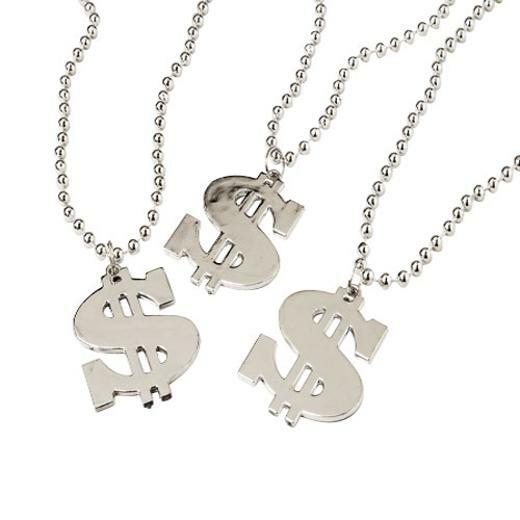 Dress up your pimp, gangster, or rap star costume with these money themed necklaces. These are also a great item for casino party favors. Looking for unique and fun wearables for Mardi Gras? We have a wide selection of costume accessories to make your Mardi Gras celebration a hit! Find the bling you need to make your Mardi Gras or Carnival costume a hit! L: 1.5 in. W: 3.0 in. H: 21.5 in.